They're quite cute really, aren't they? You can count the number of interesting looking games coming to DSiWare on your fingers, but it might be time to break out a toe as Intrinsic Games announces Amoebattle coming to the download service later this year. 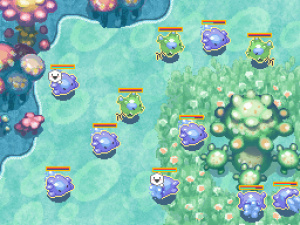 The team behind Divergent Shift is bringing a new real-time strategy title to DSi, putting you in charge of an army of single-celled organisms to defeat an evil (presumably) infection. There'll be nine different units, each with unique abilities, ranging from Sharks that hide in water to poisonous Vipers. You'll also have technological probes at your command, so it's not all one cell in the sea action. We have the first screenshots below, with Intrinsic promising regular updates every Wednesday over at the official Amoebattle website. Los Angeles, CA - June 1, 2011 - Intrinsic Games today announced Amoebattle, a brand new IP from the indie developers behind Divergent Shift that raises the bar for DSiWare titles. Lead an army of witless but loveable single-celled organisms against a mysterious infection in this revolutionary take on the real time strategy genre. Built from the ground up for the Nintendo DSi, Amoebattle takes full advantage of the touch screen and dual screen interfaces to deliver an intuitive and engaging title that players of all skill levels, from newcomers to genre veterans, can enjoy. Explore the beautiful and alien landscape of the microscopic world as you feed and grow your amoebas, discover new species, and battle hostile microbes..
Command 9 different types of amoebas, each with their own distinct strengths and weaknesses. Create a swarm of Locust amoebas by utilizing their instant replication trait, or hunt down other microorganisms with the paralytic toxin of the Viper amoeba. Use the terrain to your advantage by placing herbivorous Queen amoebas next to empowering algae patches or hiding your carnivorous Sharks in murky water to prepare for an ambush. Turn the tide of battle by deploying technological probes such as the freezing Cryo Probe or the mind controlling Purify Probe. Look forward to updates, new game information, interviews, screenshots, videos, and more every Wednesday on the Amoebattle website at www.Amoebattle.com. Amoebattle is planned for a 2011 release on DSiWare. Oh, sounds interesting. I like Tower Defense games. Sounds promising. If it is 500 points, then consider me sold.